thanks to everyone who took part in our first ever sponsored cycle ride 'Bike for St Basils' - aiming to help us break the cycle of homelessness. Fifty St Basils supporters took part in this our first ever sponsored Bike Ride 'Bike for St Basils', starting and finishing in Sutton Coldfield. The majority of participants took on the 50 mile route from Sutton Coldfield through Cannock Chase then onto Lichfield and back. Some beginners or families with children opted instead for the 9 mile route around Sutton Park. We were fortunate to have perfect cycling weather and everyone seemed to have a great day. We've received some excellent feedback regarding the route (apart from one or two of the hills - but how else would you get that wonderful sense of achievement? ;) and, as our Twitter feed shows, some participants are already asking how they sign up for next years! This event has already raised over £1000 with more to come we hope from Sponsorship. Everything raised from this sponsored challenge will go towards supporting our young residents, who have experienced homelessness, to get back into education, training and employment so that they can gain the skills they need to move on succesfully with their lives. 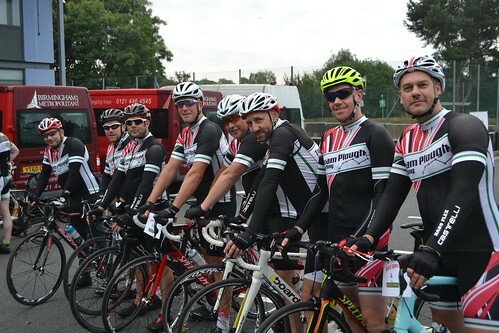 Huge thanks to our Sponsors Dixons Estate Agents who provided the checkpoints, BMET college for allowing their carpark to be the start and finish point, West Midlands Hire and Haulage for the free use of their van and Urban Cycles for all the support they gave to this event and all our riders on the day. Click on the photo below to launch our interactive photo album for this event. If you took part feel free to download any photos that are for your own personal use straight from Flickr. Thanks to Mike Chalkley and Urban Cycles for their photos which have been added to this album. Check back here soon (www.stbasils.org.uk/bikeforstbasils) for the date of the next one!